In this project we are going to interface Ultrasonic Sensor & Arduino with OLED Display for designing Range Finder. Ultrasonic sensor is used to measure the distance. It acts as a Sonar. It sends an ultrasonic wave of certain frequency which comes back after hitting the object and calculates the time traveled by it. So lets learn about Distance Measurement Using Arduino & HC-SR04 Ultrasonic Sensor. The HC-SR04 ultrasonic sensor uses sonar to determine distance to an object like bats do. It offers excellent non-contact range detection with high accuracy and stable readings in an easy-to-use package. From 2cm to 400 cm or 1” to 13 feet. Its operation is not affected by sunlight or black material like sharp rangefinders are (although acoustically soft materials like cloth can be difficult to detect). It comes complete with ultrasonic transmitter and receiver module. Ultrasonic sensors emit short, high-frequency sound pulses at regular intervals. These propagate in the air at the velocity of sound. 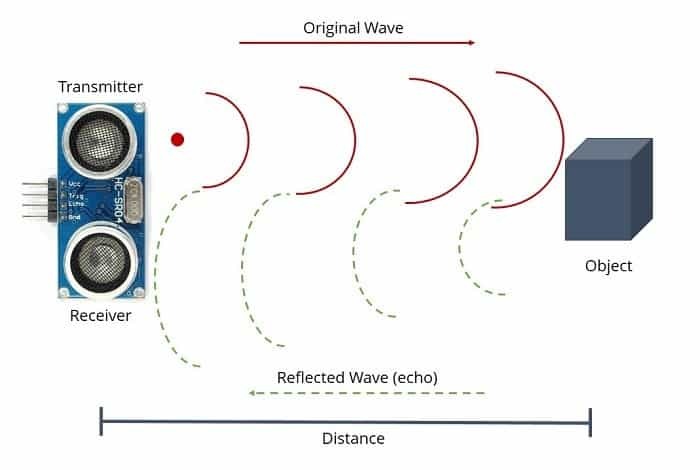 If they strike an object, then they are reflected back as echo signals to the sensor, which itself computes the distance to the target based on the time-span between emitting the signal and receiving the echo. We will have to convert this time into cm to calculate the distance traveled. We will use the following equation to calculate the distance. Ultrasonic wave is basically a sound wave which travels at a speed of 340 m/s (0.034 cm/s). The ultrasonic sensor is measuring the time it takes to hit the object and then come back but we need only time that it takes to hit the object. So, we will divide it by 2. This is a 0.96 inch blue OLED display module. The display module can be interfaced with any microcontroller using SPI/IIC protocols. It is having a resolution of 128×64. The package includes display board, display,4 pin male header pre-soldered to board. For project Range Finder Using Ultrasonic Sensor & Arduino with OLED Display, copy this code then compile and upload to your Arduino board. But before that you need to add these libraries. So download from below.